For those of you who haven’t heard of Playster or are curious to know more, it’s a multimedia subscription service that offers a variety of entertainment in one place, including movies, music, books, audiobooks, and games. I’ve been using the service for the past two weeks and will review my experience in full below. I hope it will be helpful for anyone who wants to try Playster. For starters, you can access all of the subscription content from practically any device. Since it is an online service, you’ll need a good Internet connection to watch the movies or stream music and audiobooks seamlessly. However, one can also save content to your device to enjoy later while offline. You can access Playster from your web browser or through their Android and iOS apps. Although it is a full-fledged premium service, the company offers a free trial for all new users. The 30-day trial will give you access to Playster’s full catalog, and you can decide to keep or cancel the subscription after this period. Note: You’ll need to enter your credit card at the time you sign up, but you will not be charged until your trial is finished. The registration process is pretty easy. You can register directly with your social media accounts, like Facebook and Google+, or use your email address. I chose the Facebook option, and it worked without any error or issue. You can register now HERE! After the setup is done, you can entertain yourself with tons of different content. 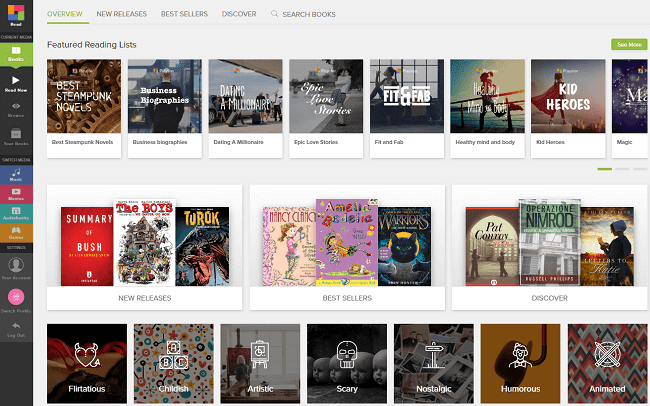 Playster also provides users the opportunity to preview their full catalog without signing up at all, so you can know if they have your favorite authors, musicians, etc. before committing. You can browse Playster’s content by visiting play.playster.com. 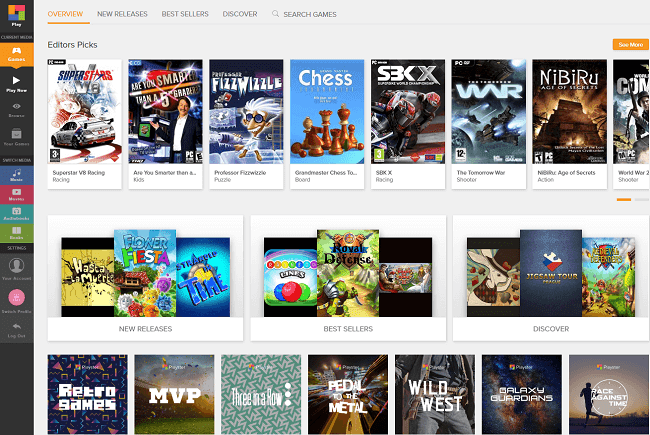 Presently, Playster offers movies, music, books, audiobooks and games. You can subscribe for each of the content categories separately, or you can opt to get everything, as well as a special gift -- a Combo Box -- which I’ll discuss later in the review. Since it is an up-and-coming service, it still has some minor things to sort out, but with so much good content to keep you entertained, you can easily ignore those small flaws. Now, let’s take a closer look at every media type and what it has to offer. 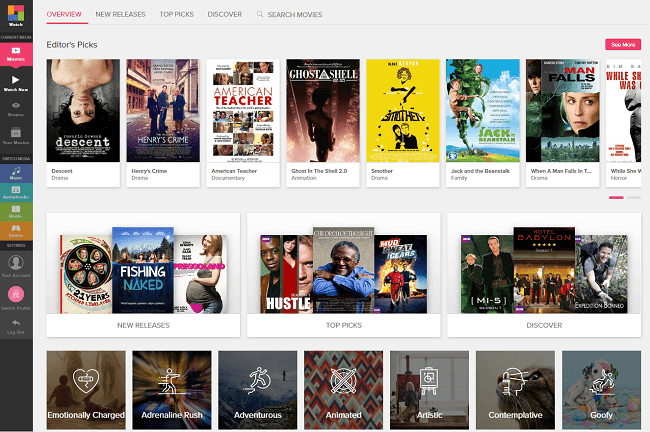 The movie section hosts thousands of movies, all of which are neatly sorted into numerous categories for easy browsing. Due to lack of time, I was only able to watch one movie so far and preview another on my phone. The streaming experience was very smooth, and the video played without any lag. One thing worth noting is that I had the best viewing experience through the Playster app, rather than a web browser, on my iPad. The selection is decent, but for now, Netflix is still King regarding original series and blockbusters. Fiction, business, young adult, thriller, sci-fi, romance, comedy, New York Times Best Sellers and much more -- Playster’s selection of books is fantastic. The books are truly the highlight of the Playster Library. You can find a huge mix of both new and classic titles for every occasion, mood, and taste. The audiobooks are also great, perhaps even better than the books because you can enjoy them while on the go! The gaming section is packed with classics and modern titles that will satisfy any casual gamer. Categories include action, adventure, and RPG games, but my favorites were the puzzles and arcade games. One of the things that made me seriously nostalgic was the presence of Duke Nukem -- the game I used to play most when I was a kid --, and I couldn’t resist starting with that one on my morning commute! The selection might not be big enough for a diehard gamer, but it has plenty of stuff for the entire family to enjoy during downtime, road trips, and travels. The diverse music offering is another strong selling point! From all of my favorite major label artists to cool new indie bands I hadn’t heard of before, I enjoyed taking advantage of the Playster music section. The playlists especially are put together well, and there’s one for every type of occasion. The most innovative feature, however, is their mood-based sorting. If you’re not sure what you want to listen to, you can click on what mood you’re in, and Playster will recommend a bunch of artists, songs, and albums that match that mood. I spent an hour alone on playing around with this new method of enjoying music, and I can say I like it. So how much does Playster cost? 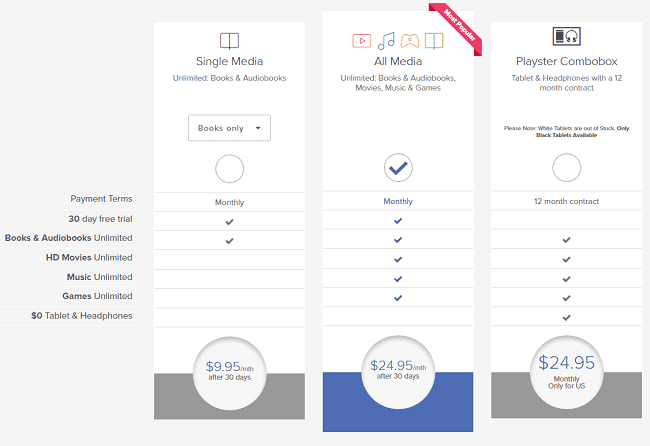 Well, the service offers an all-inclusive bundle with books, audiobooks, movies, music and games for just $24.95/month. You can opt for individual services as well, which are priced accordingly and range from $4.95 for movies to $9.95 for books and audiobooks. 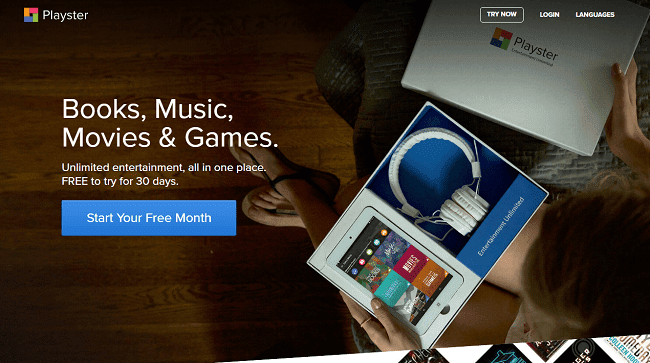 Each package grants users unlimited streaming. What’s more, if you sign up for 12 months of all-inclusive service, you’ll receive an excellent gift: A Playster Combo Box, which includes a free Android tablet and headphones. This will be yours to keep even after your 12 months are up, and you’ll only be charged $24.95 per month, just like you would be if you chose the monthly bundle instead of the yearly one. It's an exquisite deal! All in all, Playster is an excellent service that you can rely on to get your entertainment fix. Watch a thriller, read a great novel or just listen to your fave tracks -- Playster has something for everyone. You can start with the free trial first, then opt for the paid subscription if you enjoy your experience. If you’re not satisfied with the service for any reason, you can cancel your membership directly from your account. You can also contact the support team for any questions you may have, plus there is a forum on their website where you can find answers to most FAQs. Do share your thoughts in the service with us below and let me know what you think about Playster!